India is a large country with over 1.2 billion people. India is also extremely poor. When we say India is poor, what we mean is that compared to the number of people, the amount of goods and services produced is very low. In other words, India produces too little and that little amount of production has to be divided among a very large number of people. Tragically, many millions in India don’t get sufficient to eat – half of India’s children below the age of five are malnourished. For this to change, India has to either increase its production, or reduce its population, or both. Increasing production can be done by using more productive resources (more land, more labor, more energy), or by using resources more efficiently, or both. To achieve higher production and greater production efficiency, an efficient transportation system is absolutely necessary. Without it, the economy cannot progress. The backbone of a transportation system of an economy as geographically large, as densely populated, and as resource constrained as India’s has to be rail-based. Airways cannot be the long haul mass transportation system, nor can it be the road system. There is nothing as efficient as steel wheels on steel rails for transporting hundreds of millions of people over distances that are of the order of hundreds of kilometers. Roads transportation is not an option for India for a number of obvious reasons. Cars and fossil fuels are expensive. Efficient alternative fuel cars are even more expensive. With 17 percent of the world’s population and two percent of the world’s land area, India cannot afford the luxury of high speed expressways the way that the US can. India has to have a more efficient transportation system than the US because it is not even theoretically possible to emulate the US with its automobile/airlines system. The US uses approximately a quarter of the world’s total energy use with only about five percent of the world’s population. To reach US standards of energy use per capita, India total energy consumption would have to increase approximately 25-fold. To put it another way, to try to match the US with its car- and airplane-based system, India would have to use four times the total amount of energy currently consumed by the entire world. At present, India has to import over half of its fossil fuel needs and pays an unaffordable amount for it. India’s economy cannot be sustained on imported fuel. The same argument as above applies with even greater force when air transport is considered as the backbone of a national transportation system. Only a very insignificant percentage of Indians can afford to fly. By afford I do not merely mean individual capacity to pay. The system itself cannot accommodate it. You cannot have 120,000 daily flights serving India’s 1.2 billion people, which is what you would need to match the US’s air transportation system around daily 30,000 flights serving around 300 million Americans. A bit of arithmetic is all that is needed to expose the underlying reality that India does not have the option of having road or air as the backbone of India’s transportation system. We not only cannot afford the fuel (source constraint), but we cannot also afford the pollution (sink constraint) of 700 million cars and 20,000 airliners spewing exhaust — as would be required to match the US on a per capita basis. Steel wheel over steel rails is the most efficient method of transporting goods and people, especially when both volumes and distances are large. It is super efficient and clean because of a number of reasons. First, steel wheels over steel rails have very low friction and with aerodynamically designed trains, trains achieve the lowest per mile cost. Second, trains are not constrained to use fossil fuels. To power trains, electricity can be used which can be generated using whatever technology is most efficient – nuclear, solar, biomass, wind, natural gas, etc. Third, you can use the same system — the tracks and the signalling and switching system — for both passengers as well as goods. Fourth, trains can be very fast compared to roads and can be compared favorably to planes over short and intermediate distances. For short distances, planes are clearly out of the running. Consider the journey between Mumbai and Pune, a distance of around 170 kms. By the fastest road and rail connections, it currently takes three hours. By air, it takes four hours – drive to the airport, waiting at the airport, a short flight which is shorter than the time spent taxiing and waiting to land, and then a drive from the airport to the city center. Over long distances such as between Delhi and Bangalore, planes have an evident advantage for people but not for goods. But that advantage is restricted to only the very rich in India. The average person cannot afford the round-trip fare which is around half the per capita annual income of Indians. Imagine how many people would fly between NY and SF if the price was about $24,000 instead of the $600 it is. The backbone of the system is the diagonal and cross links. Trains travel at an average of 250 kms an hour and make limited stops. Mumbai-Delhi, a distance of around 1400 kms, is done in 5.5 hours (instead of the 16 hours currently by the fastest train.) Mumbai-Kolkata, around 2000 kms, is done in 8 hours. If you want to go from a town close to Mumbai to a town close to Delhi, you do the journey in three bits: two short distance segments (relatively slow) and one high speed long distance train. The short distance segments will be covered by road or by rail and they serve as the “integrated” part of IRTS. For short distances, the road system and the existing rail system would suffice. For instance, a journey from Pune to Chandigarh would involve a bus or train from Pune to Mumbai, a high-speed train from Mumbai to Delhi, and then a train from Delhi to Chandigarh. This is a hub-and-spoke model with multiple hubs (Mumbai, Nagpur, Delhi, Kolkata, Hyderabad, Chennai, Bangalore), each connected to a bunch of spokes that terminate in towns close to the hub. The most obvious point is that it is massively expensive to build a rail system. Current per mile of infrastructure for high speed rail is around $10 million per km. To build the backbone links outlined above would require 10,000 kms of high speed rail. So the cost will be around $100 billion. It looks like a very large sum but it is not actually. First, it is a capital investment, not expenditure. What the IRTS will do is to increase the efficiency of the economy, which means that it will produce more stuff than it takes to build it. Second, building it will give a boost to the economy. The question is where does one get $100 billion to do this. One way out would be to involve the public sector in partnership with the government, or “private public partnership.” The government owns the land on which the existing rail system operates. So that could be the contribution of the public sector. The rails can be farmed out to the private sector on a “build and operate” scheme. And the rolling stock can be owned by private sector firms. These private sector firms can operate trains just as they operate airlines today. They can import the best available train technology from Japan and France just as airlines import planes from Airbus and Boeing. The world is awash with liquidity these days. India needs to come up with projects which will attract these savings. Building modern railways for India is one such project. The IRTS will have to be built from scratch. Doing so will involve the labor of millions. Just like the interstate highway system did for the US, it will give a permanent boost to the growth of the economy. Spending $100 billion will generate direct employment. Then there are secondary effects which arise from backward and forward linkages. Forward linkages occur when the product or services from an industry are used by other industries. The agricultural and manufacturing sectors will gain from forward linkages. A significant portion of agricultural production is wasted because of poor transportation. This wastage will be reduced by having an efficient rail network. Backward linkages are those that connect an industry with other industries that supply inputs to it. For building a rail network, the backward linkages are to the industries that supply inputs such as steel and other manufactured goods. Railways also have forward linkages to manufacturing since industries use rail services for moving their intermediate and finished goods. It is fair to compare India with China with regards to railways. China has around 76,000 kms of railways, which is only behind that of US and Russia. By 2020, it is expected to reach 100,000. China also has the world’s fastest train. Defined as speeds exceeding an average speed of 200 km/hr, China has the world’s longest high-speed network of around 8,400 kms, and has 2,200 kms of routes exceeding 350 km/hr. The railway network in India has a total route length of the network was 64,000 kms, about a third of which has electric traction. It does not have any high-speed network. The most prestigious trains in India, the Rajdhanis, average less than 100 kms per hour. The Rajdhani between Mumbai and Delhi averages 86 kms per hour. We have to keep in mind that as late as the early 1990s, India was ahead of China in route kilometer per capita and total route kilometer. In the decade starting 1992, China invested US$85 billion and jumped so far ahead of India that it is unlikely that India will ever catch up with China. India invested only US$17.3 billion in the same period. India’s route kilometer grew by only one percent and China’s grew by 24 percent. 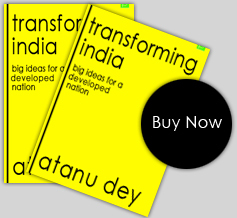 What we have in India is a creaky dilapidated outmoded transportation system. More than roads and airports, India needs a great rail transportation system which will form the foundation upon which a modern Indian economy can move and grow. It is a great challenge and if articulated well, it can galvanize the economy. It will not be easy but then easy things are not worth doing and are rarely transformational in their impact. The movers and shakers of India should look for projects that transform, hard though they may be.